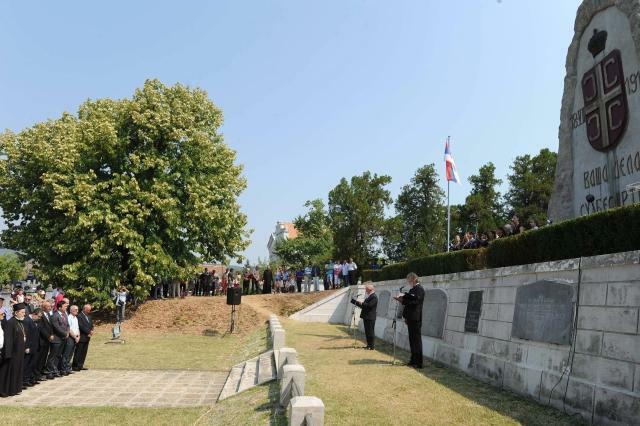 BELGRADE -- Monday [August 19, 2013] marks the 99th anniversary of the Battle of Cer, in which the Serbian Kingdom soldiers defended the country against the invading Austro-Hungarian forces. The Serbian army won the battle - the first Allied victory over the Central Powers in the First World War. The Austro-Hungarian army launched its attack on Serbia from Bosnia-Herzegovina on August 12, 1914 and went on to take the town of Šabac, but the Serbian forces made a strong stand at Mt. Cer, 35 kilometers from the city. The first big confrontation occurred in the night between August 15 and 16 near the village of Tekeriš, and the two armies continued to fight through August 20 along a 50-kilometer-wide front. The Austro-Hungarian forces, commanded by Oskar Potiorek, numbered 200,000 men and modern artillery. They went up against the army of the Kingdom of Serbia, whose supreme commander was Prince Regent Aleksandar Karađorđević and which counted on a force of 180,000 soldiers - and "unparalleled morale," Tanjug is reporting. On their way to victory, the Serbians were helped by a good strategy devised by the supreme command, along with their experience in the modern warfare of the time gained during the Balkan Wars. During the night between August 19 and 20, the Austro-Hungarians were forced to retreat back into Austria-Hungary, and the so-called Cer Operations ended on August 28, when the Serbian army re-entered Šabac and forced the enemy to flee across the Drina River back to Bosnia-Herzegovina, at that time the annexed territory of Austria-Hungary. About 25,000 Austro-Hungarian soldiers were killed or wounded, and over 4,500 were taken as prisoners of war. Serbian casualties comprised a total of 16,045 non-commissioned officers and soldiers and 259 officers, with 2,107 of them killed and 250 taken as prisoners of war. In his report on the Austro-Hungarians defeat, journalist Egon Erwin Kisch wrote: "Our army has been crushed and it is running away in utter disarray, in a wild and panic-stricken flight: a beaten army - no! an uncontrolled mob running towards the border in senseless panic." "These Serbs are remarkable... they know how to defend their land," Kisch said. The way the Battle of Cer was fought and won is viewed as a masterpiece of the art of war, a remarkable example of transition from a strategic defense to a counter-offensive. Today, it is studied at major military academies across the world, including the United States Military Academy (USMA) at West Point. As the most important operative group, the Serbian Second Army and its commander General Stepa Stepanović played the key role in the battle. Stepanović prepared a plan of action and sent a regiment to take control of the Cer ridge at the crucial moment, for which the prince regent awarded him the title of a duke. Defending the homeland and the people from the Austro-Hungarian aggression, the Serbian army showed exceptional courage and patriotism which will remain engraved in the collective memory of the nation forever, Tanjug said in its report. The news that the Serbian army defeated the Austro-Hungarian troops came as a surprise for the world public which did not expect a small country, exhausted by the Balkan Wars in the previous two years, to hold up against the major military force. The Serb victory also helped the morale of the Allied forces which were losing battles on all battlefields at the beginning of the war. Because of the Serbian victory in the Battle of Cer, Austria-Hungary was late in refocusing its troops toward the Eastern Front which later facilitated the operations of the Allies.